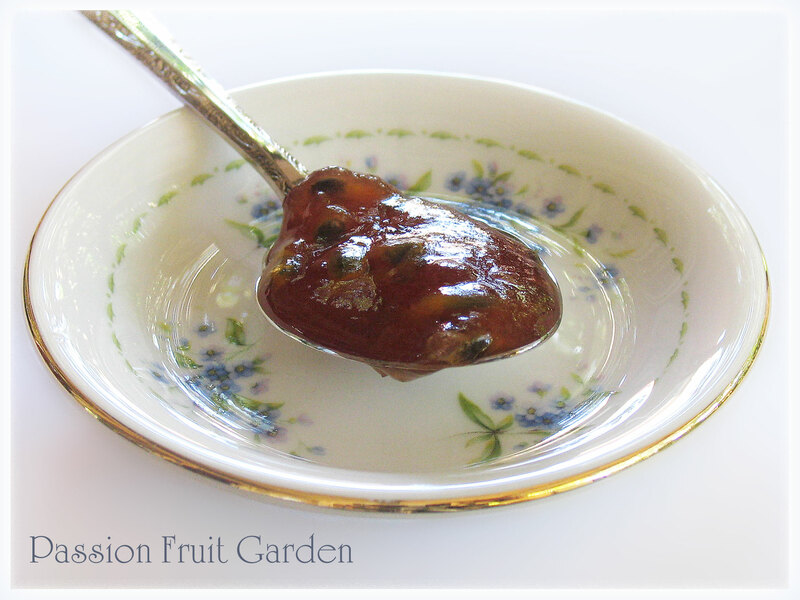 As you all know, I recently made passionfruit jam (and did a post on it). I was intrigued by the idea of making jam from the soft inside part of the passionfruit shells so I decided to give it a go. I was very pleased with the result. The jam tastes amazingly good but is quite thick and both Maus and I prefer our jam to be on the runny side. The photo left is of my first batch. You can see how thick it is . After I made my first batch, I found another recipe where the passionfruit pulp was not added to the jam until after setting point had been reached. This variation appealed to me for two reasons. Firstly, I have read, several times, that cooking passionfruit pulp adversely affects the taste and, secondly, I thought by adding the pulp back later, the jam would be runnier. Luckily, even though it is the end of the passionfruit season, I was able to rake up the requisite 24 passionfruit to give this technique a go. The jam was lovely. The passionfruit flavour was even stronger than my first batch. It was tangy and fresh, just like the fruit, and the consistency was perfect. You will note from the photo that I didn’t strain the seeds out this time. To strain or not to strain … it is still the question. Do as you will. I am surprised that the seeds don’t bother me at all and they make the jam really look like passionfruit jam. All in all, I am very, very happy with this batch. If I make passionfruit jam again, I will most certainly prepare it this way. I decided to do another post on the recipe so you only need to access one page for the recipe. The photo below is the scooped out inside part of the shells which form the basis of the jam. Weird looking I know, but they make a great jam. Give it a go if you ever have excess passionfruit. Here is the recipe, again, with the amended method. These quantities made 6 jars of jam. Add one cup of the reserved cooking fluid to the retained shells and process or blend until completely smooth. I blended mine with a stick blender. Put the blended shells into a large pot and bring to the boil. Add the lemon juice and sugar, stir until the sugar dissolves and then boil rapidly until setting point is reached. Either check the temperature – 105°C – or test a small amount on a cold saucer. Remove the jam from the heat and pour in the retained passionfruit pulp. Stir to combine. 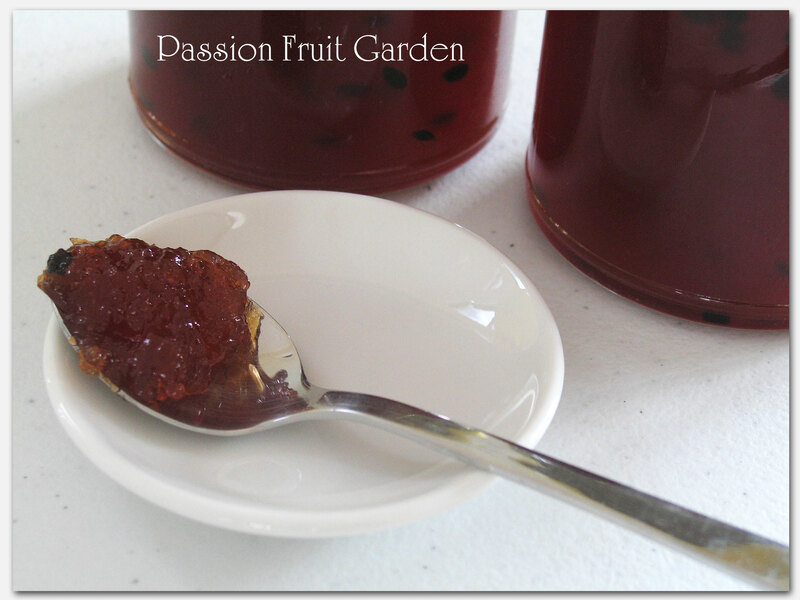 This entry was posted in Homemade Produce, Jams and Jellies, Passionfruit and tagged How to preserve passionfruit pulp, Passionfruit skin jam, What to do with excess passionfruit? by Glenda. Bookmark the permalink. Hi why use the skins. Hi Jayne. The skins have pectin in them which makes the jam set. If you didn’t add the skins you would have passionfruit syrup. Glenda, thank you so much for this inspiring recipe..I have 5 Gallon ziplock bags of passion fruit pulp in my freezer looking and waiting for the perfect canning recipe!! I live in Puerto Rico and my neighbor has a vine climbed up the electric line so they have been dropping in front of my house all summer long. All those seeds in the compost have vines sprouting up all along side my other plants..so I will replant by the fence. Not sure what variety but these are purplish and I didn’t see those beautiful flowers they produce on this fine. But still they are yummy and should have plenty of my own next year or whenever they fruit.. its always hot here. But I love the fact that you found a pectin source within the shells. Brilliant!!! Apples are not native to tropical island and shipping it in didn’t seem cost effective. Still have some whole fruit from when they needed to chop down vine 😦 was weighing down power line. But will not waste the last of the under ripe shells I still have. So just to confirm as you said heat affects the flavor, how do can for long term storage? Do I need to add citric acid or will adding pulp back in add enough acid to quickly water bath and seal lids on jar? Hello! I’ve been trying to make passion fruit jam, using a different recipe (which uses half the number of fruit) but it never sets. I want to try your recipe but note that you use 24 fruit! The passion fruit that grow in my garden (south east Queensland) are the yellow type and much bigger than the purple type you see in the shops. I’m wondering whether my fruit-sugar ratio is off because of this. A pile of 10 fruit weighs about 1.1 kilos for me! Should i use the same weight of sugar as fruit? I know this is an older post so thanks in advance if you can help. Hi Jo, Were you using the white pulp from inside the skin? If not your jam will not set as there is no pectin in the juice. 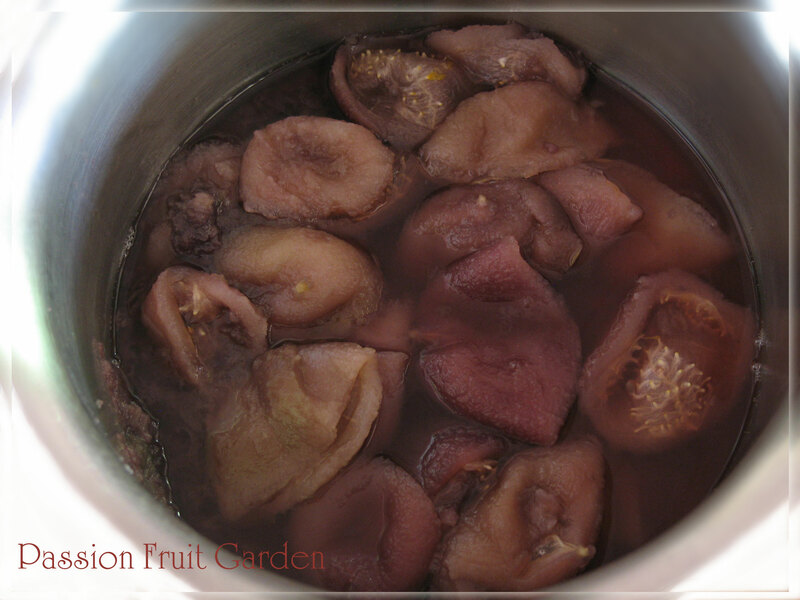 If you use the white pulp, the jam will set as it is very high in pectin. I was using Red Panama Passionfruit which are slightly larger than the purple variety. There is a picture of mine in this post. Thank you for the quick reply! I did use the pulp last time but there are so many variables in jam making it seems. My passion fruit are marginally larger, about 11cm. I got six small jars out of a dozen fruit. I’ll try your method (which adds the sugar and lemon later as well as the seeds after) this time hopefully I’ll have more luck! Hi Jo, let me know how you go. Very interesting Glenda. What happens if you do not remove the outer skin from the skin pulp after stages 3, 4 and 5 in your article? Hi Glenda I found your recipe a beautiful way to use the passionfruit more fully. The pulpy skin bits taste like a vegetable and the resultant jam has the consistency of apple butter. I love the colour too so rich, fruity and inviting! Hi Doreen. I am glad you liked the jam. I made another batch the other week and the jam was a bit thick. It was not nearly as good as this batch. I will have to try again. Looks delicious/ tried my own and first jam last month with ripe crinckled plums… did’nt was’nt to put much sugar and did nt have pectin so mine came out like a jelly than jam and little bitter but nice to put on morning as compote.. I like the seeds.. thru burst and give your jam the passion fruit look glenda. well done! Love the no waste lateral thinking. I will try this next summer when my vine produces again. my compost usually has the benefits of the all the skins. Was there a more concentrated passionfruit flavour using the skins? I make a blood orange & passionfruit granita restuffing either the half orange skin or passionfruit skin to serve. Hi Robyn No, I think most of the passionfruit flavour comes from the pulp. The skins have piles of pectin in them so they make the jam set. Without the skins, you would get passionfruit syrup. Looks fab, Glenda, have you tried it with peaches? It’s exquisite! No Liz. I haven’t tried it.